From the Steam Controller, SteamOS, Steamlink, Steam Machines to SteamVR, It’s hard to argue that its just another digital delivery platform for PC and Mac. It’s more, much more. The Steam Controller lets you play your entire collection of Steam games on your TV—even the ones designed without controller support in mind. Featuring dual trackpads, HD haptic feedback, dual-stage triggers, back grip buttons, and fully customizable control schemes, the Steam Controller offers a new level of precise control. Find your favourite mappings in the Steam Community, or create and share your own. Bring your existing collection of PC games with you to the living room. Simply connect Steam Link to your TV and home network and access your full library of games and the complete Steam catalog, all from the best seat in the house. Thousands of games, millions of gamers. Everything you love about Steam is coming to a powerful new family of entertainment devices. Introducing SteamVR, a full-featured, 360° room-scale VR experience. Available in partnership with HTC spring 2015, the Vive Developer Edition is a development kit that includes a headset, two single-handed controllers, and a system that tracks them all in the same absolute space. Experience high-end VR paired with everything you love about Steam. 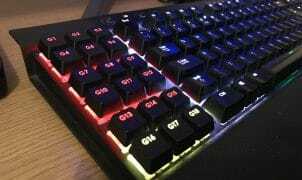 Whether you’re interested in third-person adventure games, sports management simulators, or the next big genre that hasn’t been invented yet, PC gaming has you covered. 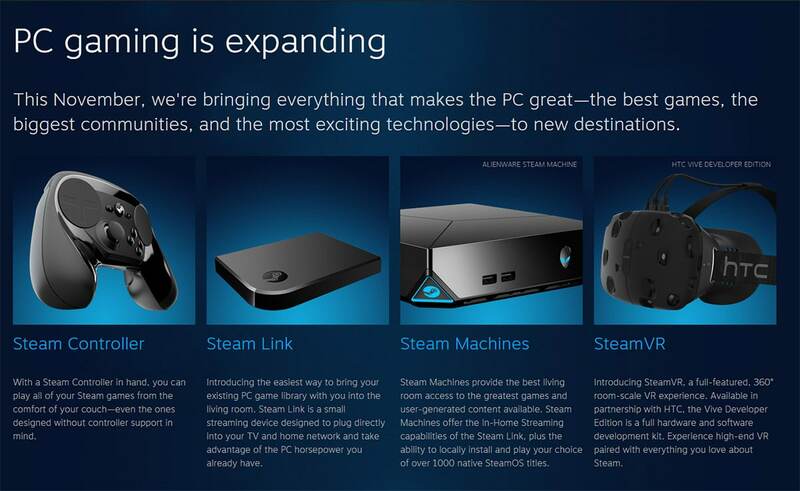 And now, with Steam Machines and Steam Link, so does your living room. Everything you know and love about Steam is headed to your living room. With Steam Machines and Steam Link you will be able to access your library of games, play with your friends, and bring the 125 million user Steam community to your living room. Game Hubs, Workshop, Broadcasting, Groups and Discussions will all be accessible from your sofa. Steam is always evolving and so will your living room with upcoming content like your favourite movies, TV shows and music. As always, head over to the steam website for the latest on all things in the Steam Universe.